Posted on February 3, 2008 by Linewbie.com Posted in applications/software, browsers, debian/ubuntu based, guides, how to, mac/osx	. This guide explains how you can install Apple’s Safari browser on Ubuntu 7.10. As there is no Linux version of Safari, we will run it under Wine. We will use a tool called PlayOnLinux to install Safari under Wine. With PlayOnLinux you can install lots of Windows games and some Windows applications (such as Office 2003, IE6, MS Money, etc.) on Linux. Installing Safari on Linux is good for people such as web designers who have switched to Linux but still need to test their web sites in other browsers. Tags: browsers, PlayOnLinux, Safari, ubuntu	. Posted on November 1, 2007 by Linewbie.com Posted in linux/unix/os distros, mac/osx, news	. Appleâ€™s latest incarnation of OS X â€œLeopardâ€ will be able to read OASISâ€™s ODF. 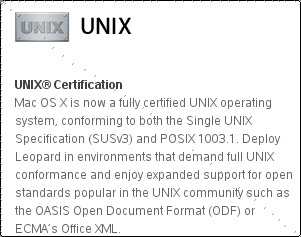 Good news for open source community and for the compatibility as whole, but then how does ECMAâ€™s Office XML correspond to UNIX specs!!! How about saving files in ODF â€¦ is it there in Save As option. Here is what else Leopard is going to feature. Tags: apple, apple leopard, leopard, linux, oasis, oasis odf, odf, open source, os x, osx, osx leopard	.